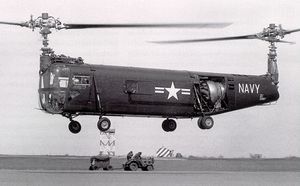 A U.S. Navy Bell XHSL-1 (Bell Model 61) prototype in flight, the first USN helicopter fitted with a dipping sonar. Circa 1953. This page was last edited on 30 July 2014, at 19:12.